It's another dreary day here in Nova Scotia, so when we were give the opportunity to write about a far away tropical destination we figured it would be a great diversion! 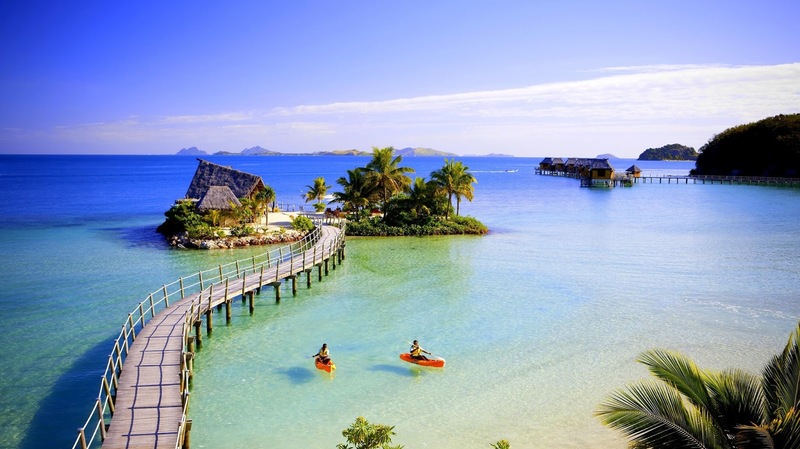 So we did some research into visiting the South Pacific island nation of Fiji, and after looking at all of the options, Fiji is definitely on our list of places to spend a month or so! Today's header picture alone is enough to brighten up my day. Do you know exactly where Fiji is located? Well, it's in the South Pacific Ocean, about 3 hours flying time north of New Zealand. And, about 5 hours flying time south of Hawaii. Fiji and the rest of the world. A closer look at the islands themselves. When I first think about Fiji, I think about spending time lazing about doing nothing but reading a book and staring at the beautiful scenery, But in actual fact there are a lot of things to do in Fiji that would keep us busy for at least a month! Hiking of course would be on our agenda, but many of the roads are also suitable for biking. Don't forget though that there are almost a million people living on these islands, so you still have to be on the lookout for traffic! Fiji has fantastic year round weather, although there is a slight possibility of South Pacific hurricane season that runs from November through April. Fiji sounds like it might be an expensive place to visit, but in actual fact it's only expensive to get to. Once you're there, it's easy to find inexpensive local accommodation. Airfares are fairly high though. Normal round trip fares from Los Angeles run around the $1,200 per person mark but if you're patient and you wait for the right fare you should be able to find a deal at around $800 per person. Today's header picture makes me want to fly there now! Fiji is a popular honeymoon destination, and it's easy to see why. And it's easy to why tourism is the number one driver of the economy there. It looks simply beautiful. I've now got Fiji on our list for cheap airfare deals. I'd love to spend a month exploring the islands! That sounds like an awesome plan , can hardly wait for the tour with you. We will make it there one day, it's just a matter of when! Great thing to dream about on a cold wintry day. I'm sure you will make it happen. The colour and clarity of the water always amazes me. Lately we've been dreaming of Maui. Don't think I could do a month though, but we'll see. I agree Bob, the clarity of that water is totally amazing! I don't think we would have a problem doing a month in Maui, especially when you consider what your winter has been like. Couldn't ask for a much better solution to the cold! Opposite of Nova Scotia! But then, so is Las Vegas! As soon as you get into colder temps you always think of warmth somewhere else! Off topic, next Friday (if you can), check out Amazing Race on TV, they will be in Namibia! You may see some sights you are familiar with ! You noticed, huh? The novelty of cold and snow is okay for a week or so, but it gets old real quick! Yes, we've been watching Amazing Race so we're looking forward to next week's episode. I'm sold, we want to go there:) Actually it has been on our list for a long time. I was hooked after reading a number of early around the world sail accounts of the place. Looks like we will just have to meet up there then! ;-) It sounds like a perfect location even though we aren't real beach people, I think even we would love it there. I only saw that header photo and said...What? How did they get there so fast? You tricked me. But, wow does it look like a gorgeous place! Yes! In fact, I see 184 listings in the city of Nadi. So, lots of choice. I think Fiji would be well worth the expensive airfare! We did a stopover in Fiji several years ago on a trip to New Zealand. We traveled on Air Pacific out of LAX which had a free Fiji stopover with fares to NZ. You can fly into Auckland and return from Christchurch on AP. We remember a Fijian "Firewalker" over hot coals at the hotel. Great beached and tropical vegetation. The men wear skirts and greet you with a "Bula Bula"
Sounds perfect! Air Pacific seems to be much like Iceland Air, they offer a free Iceland stopover that is good for up to 8 days I believe. We think this is a great way to encourage you to take time to stop and take in the sights, I know we would!